We stopped into our local 7-Eleven for a Slurpee and noticed that Zynga seems to be pretty heavily invested in that convenience store chain this summer. There were signs all over the place and our Slurpee cups were festooned with Zynga game graphics. And each cup has a code on the bottom that you can use to redeem for various prizes; a special in-game item, a logo magnet for one of the three featured games, some game time cards, or a drawing for one of three T-shirts. But wait, that is not all. 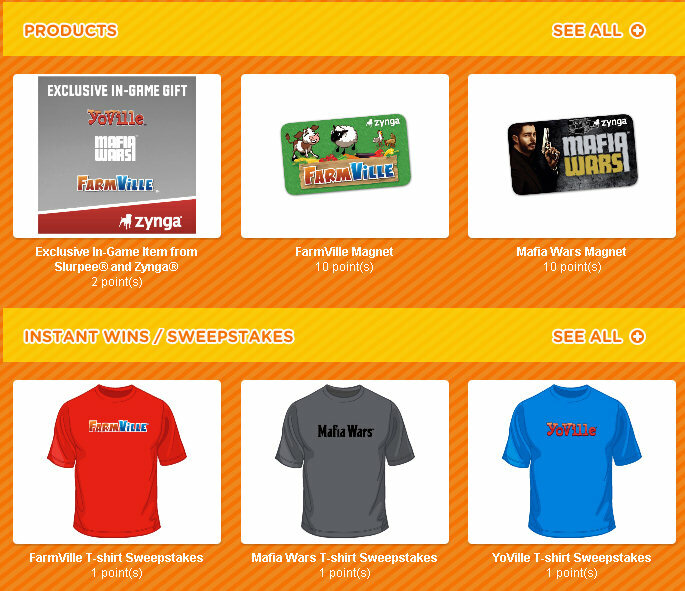 I went to Slurpee.com to see what the prize deal was, and while some prizes are available via Slurpee points, other special in-game items are available with the purchase of other 7-Eleven products. So if you are a compulsive FarmVille collector, you will have to get out there and start shopping at 7-11. The good news is that your friends don’t have to buy these items for you and your friends can’t spam your wall every time they buy a Slurpee. The bad news, for Darren at least, is that not all of them are available in Canada. Oh, and that while you can redeem the codes online, they only send you the code for your item through the mail. Prize fulfillment is not quite fully in the digital age yet I guess. But when you’re all over 7-Eleven, you’re pretty much mainstream. This entry was posted in Casual Games, entertainment, Zynga and tagged 7-11, 7-Eleven, Farmville, Mafia Wars, Southland Corporation, yoville on June 17, 2010 by Wilhelm Arcturus. We at TAGN, who have apparently started using the royal first person plural, have decided to pitch in and help Tipa while she is adjusting to a new work schedule. So, we give you the Daily Bog Roll! Our top story today: Blogalissimo Francisco Tolbold is still dead! Or at least he is taking a break from blogging. Work on Toblopedia has been suspended out of respect for the auteur. Candle-light vigils have been reported in major cities. In a change of editorial policy, Syncaine put out a Friday post that did not attack World of Warcraft, but rather defended the standard $15 a month subscription plan in the case of well established, triple-A titles. Don’t cry for me Rob Pardo. Potshot, tiring of the “Horse Dialogs,” runs off and actually plays Runes of Magic to see if it is even worth worrying about their cash shop policies. Scott Hartsman was deported from Ohio or something. Anyway, he is out of a job. Eric the Elder Gamer points out that the live team, the team that runs an MMO after it ships, often isn’t the same group that built it. Wasn’t that Scott Hartsman’s job at SOE? Anyway, he calls them the “B-Team,” at least when it comes to WoW. Live team people commiserate. Another former EverQuest II guy, Ryan Shwayder, wants to know where all the “social” went in our MMOs. He has a laundry list of things that have made us solo-nauts in these games and then says that the Copernicus project at 38 Studios is going to fix all of them. How it will do this though is left as an exercise to the reader. Chiming in on the Professor Goodbar drama, Gevlon says that winning is everything and the ends more than justify the means. But he says that about everything. Meanwhile we find out what the Professor thinks about somebody quoting from his work… though he uses the word “srsly.” No word yet on a coconut powered netbook. Recently some nun said space is boring. (To be fair, I am pretty sure that is church doctrine.) But Mynxee at Life in Low Sec doesn’t find it boring, though she did find it a bit exasperating being lost in wormhole space. Meanwhile, Evony (a contraction of “Ever Annoying”) the self-proclaimed “World’s Best Web Game” fresh from its stunningly successful web ad campaign has begun spamming the comment threads of all the cool blogs just to make sure everybody knows they’re still alive and they have this awesome cool game and that it is free forever… or until it shuts down… whichever comes first. Anyway, go enjoy your free Slurpee at participating 7-Eleven stores. 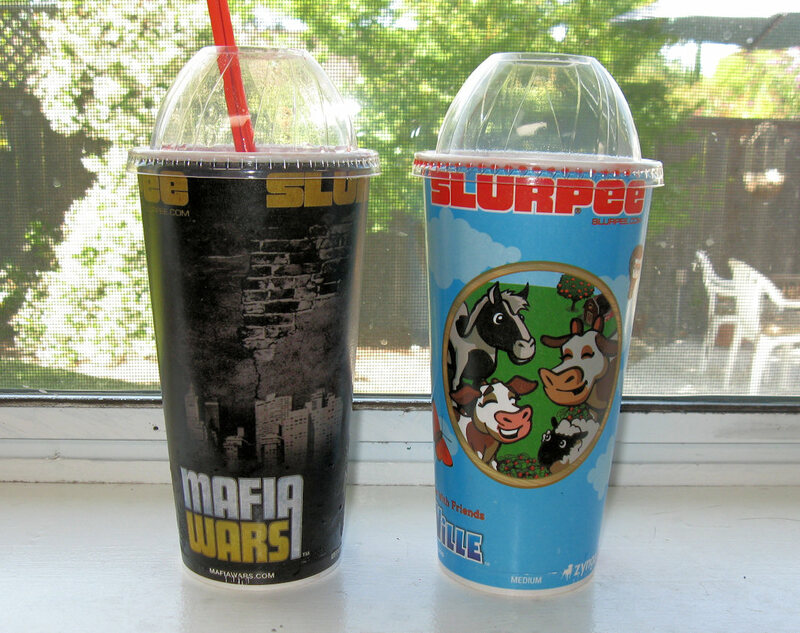 It is National Slurpee Day. This entry was posted in Blizzard, entertainment, EVE Online, EverQuest II, Humor, Sony Online Entertainment, World of Warcraft and tagged 38 Studios, 7-Eleven, Copernicus, Daily Bog Roll, Evony, Greed without end, Slurpees on July 11, 2009 by Wilhelm Arcturus.